Chromecast Ultra has all the things that make Chromecast great. Use mirroring to see what's on your compatible phone, tablet, or laptop on the TV. Try Backdrop to showcase content like your photos, social media, news headlines, and more. 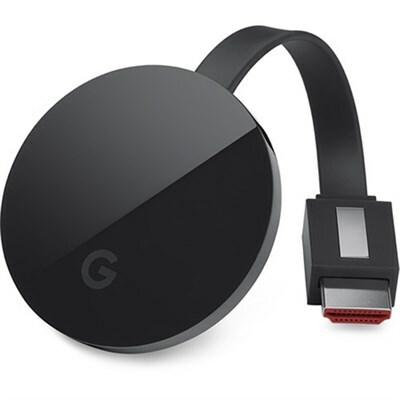 Picture quality up to 4K Ultra HD & HDR, stronger processing power for faster streaming than any other Chromecast device, and an optional built-in Ethernet adapter make Chromecast Ultra a great choice for premium viewing experiences. Use your phone, tablet, or laptop to play, pause, and adjust the volume on entertainment you stream to your TV. While you're streaming, you can also multitask - take calls or send messages without interrupting what's playing. Catch a live sporting event. Stream some dinner party music. Or maybe make it a rom-com night. You'll find something for any mood with the countless TV shows, movies, songs, and more available from apps on compatible Wi-Fi-enabled Android and iOS devices. When Chromecast Ultra is paired with a 4K Ultra HD TV and 4K content you'll be amazed by the brilliant images and vibrant colors. No 4K TV? No problem. Chromecast Ultra automatically optimizes for the maximum resolution your TV can deliver. A powerhouse processor gets your entertainment playing fast - and with reliable video performance. For tricky Wi-Fi situations, switch to the optional built-in Ethernet adapter to enjoy high-quality wired streaming. 1. Plug Chromecast Ultra into the power source and your TV's HDMI, then select the HDMI input on your TV. Presto - your entertainment goes from the small screen to the big screen. 5.0 x 4.8 x 2.6"